Due to the water pressure (just open the tap) the garden hose automatically gets longer in a few seconds! After use, the hose will shrink again to its original length. The snake grows to a large diameter for a powerful spray jet and has a length of no less than 15 meters. He takes very little space and is easy to hang. The growing garden hose has a universal tap adapter and a water cannon with 7 positions for different water jets depending on the desired intensity. 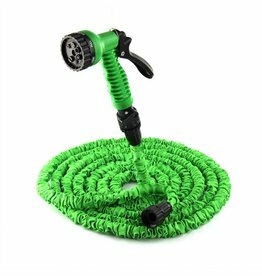 The expandable garden hose is ideal for watering plants and the lawn, but also for washing the windows or car. But that is not all: kinking is impossible due to the design of the hose. Really a helper in the garden and the garden hose is very versatile.